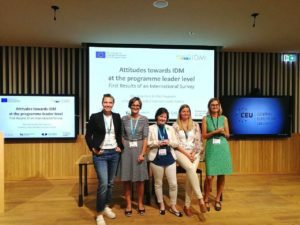 On August 28th the Enhance_IDM team presented the first results of programmes leaders’ self assessment at the 40th Annual EAIR forum at the Central European University in Budapest. The presentation focused on programme leaders’ attitudes towards inclusion and diversity management and tried to elucidate to what extent PLs’ personal backgrounds affect their perceptions and attitudes towards IDM. Also, national and/or institutional differences were addressed. The survey results were met with interest by fellow conference participants and other higher education institutions.